The holiday and early term Saturday working bees have been a huge success. 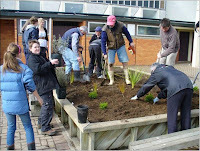 Many thanks to the students and friends of the College who contributed time, skill and money for purchasing the plants. A special thank you to Colin Telfer Ditch and Drainage -03 218 7040 for the use of his digger and Michael Tither from Plants Direct -027 736 9464. www.plantsdirect.co.nz is Michael’s website. He supplies top quality plants at extremely low prices. We ask you to support both of these businesses. Please call the College office if you would like to donate a plant to the project.